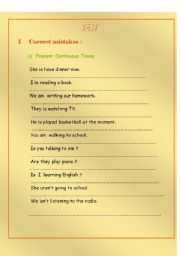 This is a test for the third or fourth form. 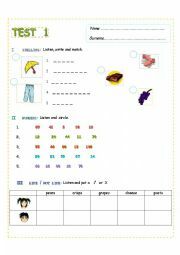 It consists of 5 tasks on 2 pages: time, days of the week, easy exercises on present simple forms,numbers 10-100, some and any. I hope some of you will find it useful. 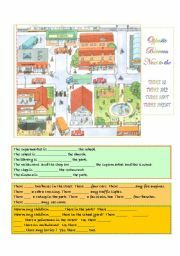 Children fill in the gaps with the correct preposition and the right form of TO BE. 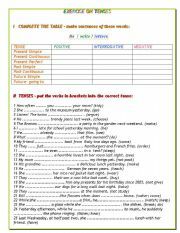 This is just another exercise on verb tenses.I included Present Simple, Present Continuous, Present Perfect, Past Simple, Past Continuous and future tenses. Answer key is on the second page. 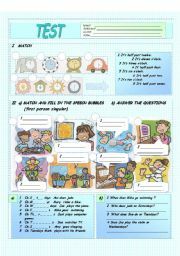 This is an exercise on answering and making simple questions. This is a test that I�ve created for my pupils in year five. It�s not visually attractive, but maybe some of you find it useful. A simple test for elementary pupils. The first part is a listening test on spelling, numbers and like/not like. The second part is a reading test on some/any, time and family. 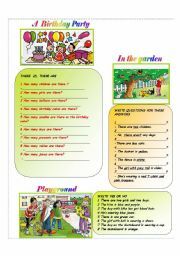 On the third page there�s a text for teachers to read aloud for the listening test. I believe that finding and correcting mistakes is a good way of learning. 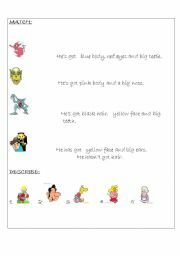 In the first part of the worksheet children have to match the description of the monster with its picture. The second part is either a speaking or a writing exercise. 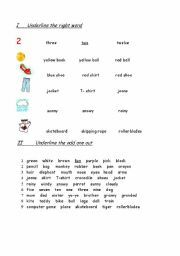 Children choose the correct spelling and decide which word doesn�t belong to the lexical set.